Both blessed and cursed, the story of the Brontë Sisters is as tragic and winding as the narratives they carved. I was about 14 the first time I read Wuthering Heights and couldn’t believe there could be such a place as the Yorkshire moors. They sounded unimaginably bleak and brutal, the wind so fierce it makes trees grow aslant, a place where vestiges of pale sunlight give way all too readily to gloomy grey skies and teeming rain. After all, I grew up in a beachside Sydney suburb with wide blues skies and an ocean that was both vast and intimate. We had sunny open faces, frolicked through endless summer days and only reluctantly donned jumpers when the weather became cooler. So the conjuring of this foreign landscape, so wild, so changeable – brown in winter, gloriously purple in summer when the heather is abloom – a place thick with nettles, so windswept you can’t hear your own voice, had an utterly profound impact. Of course, the intensity of Heathcliff and Cathy’s romance might have added something too. Heathcliff! The very name evokes strong reactions in many a woman. Such a brooding, romantic figure. I sure as hell wasn’t the only girl entertaining teenage fantasies about this dark enigmatic man. The Yorkshire landscape and Heathcliff are inextricably bonded. There’s his name for a start. More significantly, his frosty demeanour in the second part of the book is a reflection of the bone-chilling winds whistling across the moors. Connection to the landscape is evident across much of the work of the three Brontë sisters, Charlotte (1816-1855), Emily (1818-1848) and Anne (1820-1849). The daughters of a clergyman, their mother died while they were small children; they’d also mourned the loss of two sisters who died from tuberculosis in childhood. These tragedies coupled with the untamed terrain formed the backdrop for the Brontë sisters’ literary output, some of the most loved books of all time. Before those books were written, however, an apprenticeship of sorts had to be completed. They were well-read girls, having free run of their father’s library and they had the most fabulous imaginations. They loved to write, penning poems and stories right through their childhood, and created the fantasy lands of Gondal and Angria. These were detailed projects, complete with maps and plenty of illustrations by their brother Branwell, and the process was a long lesson in the effective use of language and how best to structure a work of fiction. All three girls worked as governesses and later as teachers. Charlotte and Emily spent some time in Brussels in the early 1840s to gain teaching qualifications. It was there Charlotte first fell in love – with her married professor. Nothing came of it, but it provided experience and material that she later used to great effect in her novels. What drove these girls, however, was their love of writing. 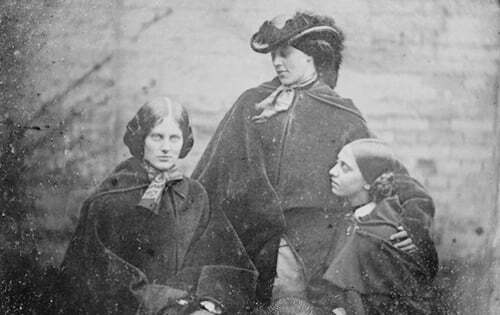 In 1846, they self-published a small book of poetry, under their androgynous pseudonyms Currer, Ellis and Acton Bell (writing not thought to be an appropriate occupation for women). The following year was a watershed. By the end of 1847, Charlotte’s Jane Eyre, Emily’s Wuthering Heights and Anne’s Agnes Grey had been published. Jane Eyre was well-received: Jane’s fraught childhood, her complex relationship with Mr Rochester, her independent mindset and the later reversal in her fortunes proved to be the perfect ingredients for success. Charlotte’s novels Shirley (1849) and Villette (1853) also feature independently minded women, something Charlotte felt very strongly about. She hated the idea of women having to rely on men. When Jane Eyre returns to Mr Rochester at the end, he’s not only blind, but stony broke; their relationship is thus put on a more modern footing where mutual respect is as important as love. Charlotte’s heroines are practical and have a degree of self-knowledge. Jane Eyre recognises that she is no beauty, but has plenty of self-esteem, a quality far more valuable in a harsh world. These days we’d call Charlotte a feminist – her book was pretty radical for Victorian times, one of the reasons it was such a success. Neither Anne’s nor Emily’s books fared as well as Charlotte’s. Anne’s depiction of a lonely governess perhaps lacked a little zing; and readers were taken aback by the raw, almost primal passion of Heathcliff and Cathy’s love in Wuthering Heights. The story of Wuthering Heights encompasses two generations and much of the action takes place well after Cathy’s death, but it’s the intensity of Heathcliff’s obsession that stays with readers. Its initial reception may have been lukewarm, but the book has long been considered one of the finest works in English literature. Anne’s second book The Tenant of Wildfell Hall (1848) was more successful. It had a scandalous premise – a woman has left her husband and taken her child with her. Even though he’s abusive and adulterous, leaving a marriage just wasn’t done. Readers were confronted with a realistic picture of what we now know as domestic violence. Tuberculosis was a constant visitor to the Brontës and sadly, Anne followed her siblings to the grave in 1849, aged 28. Charlotte’s fame was already on the rise thanks to Jane Eyre. Her true identity had been revealed and she was welcomed into bookish circles, becoming a friend of Thackeray and other noted literary figures. She also became literary editor of her sisters’ works and continued to write herself. In 1854, at the age of 38, Charlotte married Arthur Bell Nicholls, her father’s curate. She became pregnant soon after and suffered extreme nausea, causing dehydration and constant vomiting. Although the death certificate states she died of tuberculosis, scholars believe her complicated pregnancy led to her early death in 1855, only nine months after her marriage. The story-telling skills of Charlotte, Emily and Anne were shaped to a large extent by their lonely isolation in a stunningly beautiful, but often fierce environment, one that helped to create some of the most memorable characters in fiction. That all the Brontës died young gives added poignancy to their lives and works. The least you can do is Google these girls. This was beautiful. So beautiful. As a Bronte, I too am a fan of “The Bell Brothers”. Ellis is my favourite, the poet. Something that always haunted me was that her death was perhaps a suicide as she refused medical help after her diagnosis, and instead stayed in bed writing poetry until her death, poetry that Currer apparently destroyed because it was too dark. There is just so much to their story. The other thing that has clung to me is, of course, Heathcliff… ooh, that man gives me tingles!